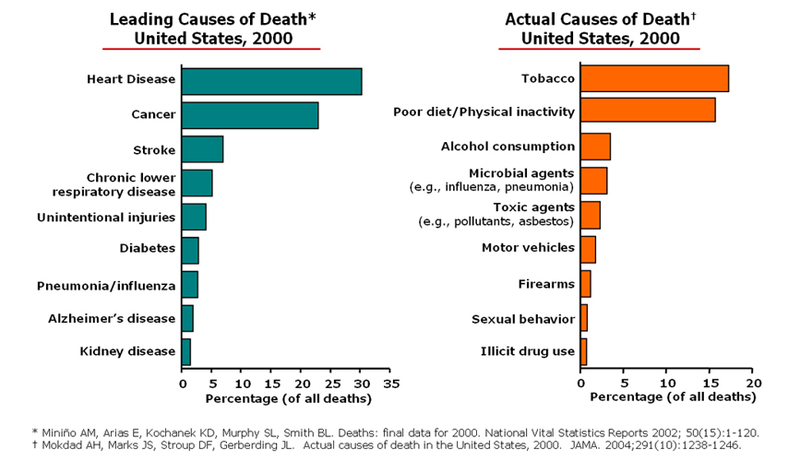 Any standard public health or medical school prevention text includes (or ought to include) some version of the figure below, which illustrates that the leading causes of death in the U.S. at the turn of the century (heart disease, cancer, stroke) were actually surrogates for what have come to be known as the actual causes of death: unhealthy behaviors such as tobacco use, poor diet, and physical inactivity. The most effective preventive services that primary care clinicians provide, then, are not screening tests but counseling interventions that aim to change one or more of these behaviors for the better. Community-level initiatives such as tobacco-free restaurants and campuses, pedestrian-friendly cities, and increasing access to nutritious food sources play a critical role in changing health-related behaviors, too. Unfortunately, the impact of behavioral or "lifestyle" approaches to prevention is likely to be limited by two factors: 1) even intensive interventions produce very modest benefits; and 2) behaviors don't exist in a vacuum, but are largely shaped by economic and social circumstances. Family medicine professor and former U.S. Preventive Services Task Force member Steven Woolf has published a number of studies showing that the risk of death is strongly associated with levels of college education and income; his research team at Virginia Commonwealth University worked with the Robert Wood Johnson Foundation to develop an interactive County Health Calculator that illustrates how many premature deaths could be avoided by eliminating educational and income disparities. Clearly, we know a great deal more about successful strategies for fighting clinical and behavioral causes of death than we do about social causes, some of which often appear intractable. But I could not agree more with the authors' conclusion that "these findings argue for a broader public health conceptualization of the causes of mortality and an expansive policy approach that considers how social factors can be addressed to improve the health of populations." The point being: poverty, discrimination, and low education aren't just social or political issues best left to non-clinicians - they're health issues, too. Health reform was supposed to have been good news for the U.S. Preventive Services Task Force. Until 2009, this independent panel of federally-appointed experts in primary care and preventive health was not particularly well known, and its evaluations of the effectiveness of clinical preventive services had no binding authority on public or private insurance plans. Within the small circle of physicians and policymakers who were aware of the their work, however, the USPSTF won accolades and respect for "calling it as they saw it," sticking strictly to the evidence and writing screening recommendations that frequently conflicted with more expansive guidelines promulgated by other professional organizations. A more politically-minded group (as federally-supported guideline committees tend to be) would probably have been unable to make such a series of controversial statements without stirring up a public backlash. But here, the USPSTF's low profile served to protect it from the advocacy groups that dominate conversations about federal coverage for health care services. But in 2009, that all changed, as the Task Force was prominently featured in health reform legislation proposed in the U.S. House and the Senate. Ultimately, the Affordable Care Act mandated that USPSTF-endorsed ("A" and "B") preventive services receive first-dollar coverage from Medicare and private health insurance plans. Scrutiny of the USPSTF quickly intensified, especially after it issued a politically-radioactive new statement that stepped back from recommending routine mammography for women in their 40s. It was tagged as a "death panel" that, in the words of one spectacularly misinformed newspaper columnist, had "gone rogue" and ought to be immediately dissolved. (Not coincidentally, there is a Roger Maris-sized asterisk in the ACA's list of USPSTF "A" and "B" services that basically directs insurers to disregard the USPSTF's 2009 breast cancer recommendations and instead rely on the 2002 version.) With the Task Force literally fighting for its very survival, it was perhaps inevitable that politics would begin trumping science - which goes a long way toward explaining why members were willing to meekly go along with the absurd cover story that their November 2010 meeting was cancelled due to "scheduling conflicts." In the 17 months since the passage of health reform, the USPSTF has been only a shadow of its independent self. After publishing an average of one new statement per month for most of my tenure on their staff (2006-2010), a public comment process imposed by the Agency for Healthcare Research and Quality turned into a bottleneck for releasing timely, evidence-based recommendations. None of the 4 new statements that have successfully traversed the public comment process has been particularly noteworthy. Osteoporosis: a modest expansion of screening to more high-risk women under the age of 65. Testicular cancer: a reaffirmation of the near-universal consensus that screening is not necessary. Prevention of newborn gonorrhea eye infections: affirming the standard of care. And earlier this week, the USPSTF retreated from its previous recommendation against screening for bladder cancer was not warranted, instead finding insufficient evidence to make a statement one way or the other. Of course, a Task Force that makes few waves is exactly what the current Administration wants. Never mind that clinicians and patients must continue to wait for long-overdue updates on screening for prostate cancer, screening for oral cancer, breast cancer chemoprevention, and vitamin D and calcium supplements. (All of these topics had already been voted by the Task Force and were within months of publication in March 2010 but have been subsequently delayed, postponed, or suppressed from entering the public comment queue.) How long can this state of affairs reasonably continue? As the 2012 elections draw nearer, how likely is it that the USPSTF will be permitted to advance any science with even remotely political implications? And - though it pains me to ask - is a Task Force that is forced to pull its punches due to politics really that much better than no Task Force at all? Is climate change a clinical health issue? At first glance, the topic of the cover article of American Family Physician's August 1st issue, "Slowing Global Warming: Benefits for Patients and the Planet," might seem out of place in a journal that aims to provide practical clinical guidance for family physicians. Past summer-themed articles have included reviews of heat-related illness, medical advice for commercial air travelers, and even health issues for surfers. By recognizing climate change as a clinical health issue, AFP joins other widely read medical journals such as The Lancet and BMJ in recognizing the essential role that physicians can play in mitigating the negative impacts of environmental stress on patients' health. Medical offices and hospitals can help by recycling; using recycled items and Energy Star certified appliances and computers; minimizing waste and waste transport by replacing single-use items with sterilizable or washable items; purchasing wind-generated electricity; and reducing energy use by turning off appliances, computers, and lights when not in use. In 2008, the U.S. health care sector spent $8.8 billion on energy to meet patient needs, not including the transportation of employees or patients to and from health care facilities, resulting in 8 percent of all U.S. greenhouse gas emissions. In an accompanying editorial, Dr. Robert Gould reviews several national and international initiatives that encourage hospitals and health systems to reduce greenhouse gas emissions, including the Healthier Hospitals Initiative and Health Care Without Harm. The above post was originally published on the AFP Community Blog. If you have a personal favorite that isn't on this list, please let me know. As always, thank you for reading! A guest post earlier this week by David Loxterkamp, MD, "Why the Hospital Matters," reflected on some negative aspects of the continuing trend of family physicians ceding hospital care to hospitalists. The following post, first published on my Healthcare Headaches blog at USNews.com, examines care transitions from the patient's perspective. A study published Monday in the Annals of Internal Medicine seems to confirm these fears. In a nationally representative sample of Medicare patients admitted to hospitals between 2001 and 2006, those who were cared for by hospitalists had slightly shorter average hospital stays and slightly lower hospital bills than those cared for by primary care physicians. However, in the 30 days after discharge, hospitalist patients were more likely to be readmitted or land in the emergency room. One possible explanation: poor communication, since hospitalist patients were significantly less likely to follow up with their primary care physicians after discharge. To improve the quality of "care transitions" between hospitalists and family doctors, some health systems have devised programs to ensure patients get the recommended follow-up care. Two studies published in last week's Archives of Internal Medicine evaluated two such programs. In one study, seniors who'd been hospitalized for heart failure at Baylor Medical Center in Garland, Texas received several home visits by specially trained nurses between three days and three months after discharge. Those enrolled in the nurse-visit program were only half as likely as past heart failure patients to be readmitted within 30 days. In another study, patients at six Rhode Island hospitals were assigned health coaches (nurses or social workers) who visited them once in the hospital, once at home, and telephoned them twice to encourage follow-up with primary care physicians and ask about any worrisome signs or symptoms. Patients in that program were nearly 40 percent less likely to be readmitted within 30 days than patients who received no health coaching. Given all of the changes that have taken place in medicine, it's unlikely that we will return to the "old days" when the same doctors were responsible for caring for their patients both in and out of the hospital. Consequently, patients need to be proactive to be sure that they receive the best post-hospital care. Being hospitalized is always stressful, but knowing that your follow-up care won't fall through the cracks may give you peace of mind. David Loxterkamp, MD is a family physician who lives and works in Belfast, Maine. He has authored A Measure of My Days: The Journal of a Country Doctor (U Press of New England, 1997) and numerous articles for professional and lay publication. He is the Medical Director of Seaport Family Practice, which was one of 36 family practices to participate in the AAFP National Demonstration Project (2006-8) and one of 25 practices chosen for the Maine Patient-Centered Medical Home Pilot (2010-12). His new book on the transformation of primary care (Conversation, Friendship, & Hope: The Journey of a Country Doctor) will be published in 2012 by the University of Michigan Press. Four years ago, Seaport Family Practice providers stopped caring for their hospitalized patients and gave up OB. Both services were an integral part of our practice for over 25 years. There were compelling reasons for stepping back. We had tired of guideline-directed inpatient medicine and its narrow markers of achievement. Frankly, we were not as good at it as others who spent most of their day in that environment. We grew tired of the hierarchy, which is not surprising for occupants of its lowest rung. We just plain tired, too, of the night call that was required of those who maintained active membership on the hospital staff. We knew that most of our work took place in the office, even when we were performing the occasional delivery, attending the episodic medical crisis, or responding to an emergency visit in the middle of the night. With all of the new talk about patient-centered medical homes, we wanted to put our time and energy into advancing that cause, on whose success was pinned the hopes and survival of family medicine. That we were, first and foremost, a discipline of ambulatory clinicians was an easy argument to make. After all, that’s where our priorities should lie. We knew that we could visit our patients any time we wanted to, although we never did, having allowed the hamster wheel to drive us with its own sense of urgency, its own unyielding momentum. Lastly, it was not hard to see that time in the hospital was financially irresponsible– slow and obtuse and unpredictable. It was much more efficient (a.k.a. lucrative) to pound out 25 office visits a day, see nursing home patients at our own convenience, and make home visits on our way to and from the clinic. Hospital CEOs and corporate executives also understand the calculus. With the majority of young graduates now preferring employment to ownership, most contracts do not include (or specifically exclude) the option of caring for inpatients. But I missed doing it, and my patients missed me. There was a longing there that I attributed to an altered sense of identity. I had gone from being the doc who did it all to a more selective provider who did some. I had chipped off a piece of my generalist framework for taking in the world. 1. Patients greatly appreciate it. Hospitalization often marks a dramatic reversal in a patient’s personal health. They are understandably afraid. The presence of a familiar face, an old friend, someone who takes time to talk and cares if they understand, let alone gives the patient his say, matters a lot. 2. The nursing staff appreciates it. They know that I am not there on business; I am there because I care about my patients. We have things to talk about. I listen to them, too. 3. The transitions of care go a little more smoothly. I can make sure that the medication lists between home and hospital reconcile; I can make sure that follow-up appointments are arranged for the next or most appropriate day. But I really don’t care if it prevents a re-hospitalization. Don’t get me wrong: I’m glad if it does, but sometimes patients need the hospital, or their own stubbornness puts them in harms way, which to the inevitable, or we all miscalculated the degree of need. It is not my fault that the hospital is so expensive, so I don’t make fixing it my top priority. 4. Lastly– and here’s the surprise– I have something to learn there, and I have something to teach. Hospitalist and ambulatory physician alike operate within a limited field of vision. We both make assumptions and decisions based on our varied training, experience, and perspective. We seldom (read that “never”) take the time to let the other know when a different decision would have led to a better for the patient, preferring instead to remain smug, distanced, and annoyed. I know it's not easy to overcome the mutual defensiveness, embarrassment of being wrong, and fear of legal reprisal that is so endemic in modern medicine. But without the effort, our patients suffer, and we never learn. It is now commonplace for hospitals and practices to implement elaborate protocols at the time of discharge, often overseen by well-meaning nurses who have been renamed as “care managers.” But they are following protocol. They are not bridging the intellectual gap, the collegial gap, between hospital doctor and his outpatient counterpart. Not every family doctor needs to be in the hospital, or deliver babies, or make home visits, or perform colonoscopies, or provide addiction treatment. But someone in his or her practice does. Or should, for the good of their patients, and for the completeness of care that their practice should provide. We are, after all, generalists. We must work hard to guard that mantle, and to emphasize the importance of human relationships across the professions, and follow our unflinching desire to do what is best for the patient, no matter what it costs in our, or someone else’s, time and money. This is why I think hospital care should matter to family medicine, from someone who has seen it professionally from both sides now. As a modest expansion of public health insurance coverage that followed President Clinton’s failed comprehensive 1994 reform proposal, the Children’s Health Insurance Program (CHIP, formerly known as SCHIP) has led to substantial reductions in the percentage of uninsured, low-income children since its enactment in 1997. Due to aggressive CHIP outreach efforts, the percentage of eligible children who received Medicaid coverage also increased during this time period, a phenomenon known as the “spillover effect.” Compared to uninsured children, children covered by Medicaid and CHIP are more likely to have a usual source of care and fewer unmet health needs; there is also evidence that children with public insurance coverage receive higher quality care for chronic conditions such as asthma. The CHIP Reauthorization Act of 2009 continued federal funding of this successful program through 2013 and added dental benefits. Despite CHIP’s accomplishments, the program still struggles to meet two critical challenges: ensuring that millions of eligible low-income children actually have coverage, and sustaining funding to support coverage for all eligible children during economic downturns. Nearly 3 in 4 children who were eligible for Medicaid or CHIP in 2005 were not enrolled in either program, a problem that has been attributed to both inadequate outreach and poor retention. Parents’ confusion about CHIP income eligibility thresholds in the state of Oregon produced what one researcher called a “gray zone” of uncertain insurance coverage that was associated with more unmet care needs. In addition, adequate state financing of CHIP is less assured during times of greatest need, as state tax revenues decline when more parents are unemployed and more children become eligible for public insurance. The end of the American Recovery and Reinvestment Act-enhanced Medicaid federal matching percentage (FMAP) rates in June 2011 is likely to place increased pressure on state budgets; indeed, many states have made deep cuts to Medicaid payments, potentially reducing access to providers for children who remain in the program. My proposal to reform CHIP to meet the above challenges consists of three related components. First, in order to stabilize CHIP funding when state tax revenues fall, I propose legislation to tie the FMAP directly to state employment rates, so that the FMAP automatically increases when unemployment rises, and decreases when unemployment falls. This proposal resembles the ARRA’s temporary addition of 6.2 points to the FMAP during the 2009 economic recession, but by acknowledging that economic conditions vary from state to state, will target extra federal funding where it is needed most. Second, to reduce confusion about CHIP eligibility status (and increase enrollment of eligible children), I propose standardizing eligibility criteria across states at 300% of the federal poverty level. The two states that currently provide CHIP coverage above 300% of FPL would have the option to maintain this higher coverage level or to scale it back in anticipation of state health insurance exchanges providing an alternate source of health insurance for these children and their families. Finally, given evidence that much of the gap between CHIP eligibility and coverage is the result of frequent and onerous reenrollment procedures, I propose to streamline this process by requiring that states re-enroll children no more often than an annual basis. I would also require that re-enrollment occur by sending preprinted forms that parents can simply sign and return if their financial circumstances have not changed. Although this proposal represents a significant improvement over the status quo, it faces political and practical obstacles. Adjusting the FMAP automatically to compensate for economic downturns would change CHIP from a “capped” block grant program to an entitlement program with an essentially unrestrained budget. Requiring states to standardize eligibility criteria and re-enrollment processes would shift the balance of the program from state to federal control. Conservative legislators are likely to resist increased federal spending and centralized control on ideological grounds, much as the Bush Administration blocked CHIP reauthorization in 2007. In addition, even though the best available evidence suggests that few children become ineligible for public insurance due to increases in family income from year to year, critics may raise concerns that a streamlined re-enrollment process will lead to inappropriate continuation of coverage for some children. Overcoming these obstacles will not be easy. On the other hand, a continuation of current CHIP policy is likely to leave several million eligible children uninsured, reduce program eligibility when state revenues are low, and increasingly limit access to care for children who obtain CHIP coverage, due to reductions in provider payments. Therefore, I recommend that this reform proposal be considered so that CHIP may fulfill its promise of ensuring health care coverage and access for some of America’s most vulnerable citizens. 1. Oberlander JB, Lyons B. Beyond incrementalism? SCHIP and the politics of health reform. Health Affairs 2009;28:w399-w410. 2. Dubay L, Guyer J, Mann C, Odeh M. Medicaid at the ten-year anniversary of SCHIP: looking back and moving forward. Health Affairs 2007;26:370-81. 3. Kaiser Commission on Medicaid and the Uninsured. Policy brief: the impact of Medicaid and SCHIP on low-income children’s health. Pub. No. 7645-02. February 2009. 4. Sommers BD. Why millions of children eligible for Medicaid and SCHIP are uninsured: poor retention versus poor take-up. Health Affairs 2007;26:w560-w567. 5. DeVoe JE, Ray M, Krois L, Carlson MJ. Uncertain health insurance coverage and unmet children’s health care needs. Fam Med 2010;42:121-32. 6. Herring B. The Medicaid program (lecture slides). Introduction to the U.S. Healthcare System. 2011 Summer Institute, Johns Hopkins University Bloomberg School of Public Health. 7. Kaiser Commission on Medicaid and the Uninsured. Fact sheet: enhanced Medicaid match rates expire in June 2011. Pub. No. 8205. June 2011. 8. Galewitz P. A dozen states slice Medicaid payments to doctors, hospitals. Kaiser Health News July 6, 2011. "Mr. Smith, let's review the results of your blood tests. Your CBC, BMP, and LFTs were basically negative. You have prediabetes and a slightly elevated LDL, and since your BMI is 28, you should watch your diet and exercise more to prevent metabolic syndrome. Oh, and it's OK to keep taking an occasional NSAID with food for your idiopathic knee pain." Huh? Although I hope I've never said anything resembling the above to a real patient, doctors routinely use so many medical terms and abbreviations that it can sometimes sound as if we're speaking gibberish. What's worse, many patients may feel pressure to simply pretend they understand what the doctor is saying. Unfortunately, that approach often leads to misunderstandings and poor health choices. A recent report in the Annals of Internal Medicine found that patients with low health literacy (the ability to read and interpret medical information) were more likely to be hospitalized, use medications inappropriately, and receive fewer recommended vaccines and screening tests. While the report only covered written materials, it stands to reason that patients also make worse health-related decisions when they don't understand medical jargon spoken in the doctor's office. So let's demystify the terms I just used with my imaginary patient—terms family and friends told me they wished doctors would explain. CBC: Complete Blood Count. This test contains four separate measurements. The two most important are the white blood cell (WBC) count, which is usually higher in the presence of a bacterial infection and lower in some viral infections, including HIV (the virus that causes AIDS); and the hemoglobin level, which, if low, suggests blood loss, cancer, or kidney problems. BMP: Basic Metabolic Panel. This test includes levels of sodium, potassium, calcium, glucose (sugar), and measurements of kidney function. It is most often used to check for dehydration in illnesses that cause vomiting and diarrhea, and to monitor patients with heart failure or kidney disease. LFTs: Liver Function Tests. Higher-than-normal levels may indicate ongoing liver damage from an infection or medicine. Doctors usually check LFTs when starting or tweaking the dose of medicines that lower cholesterol. Prediabetes: In most people, a fasting (not eating for at least 8 hours) blood sugar level should be less than 100. A person whose fasting blood sugar level is persistently above 126 has diabetes; between 100 and 126 means a person has "prediabetes," which hikes his or her future diabetes risk. Unlike diabetes, prediabetes is usually treated with diet and exercise rather than medicine. LDL: low-density lipoprotein, better known as "bad cholesterol." The less you have in your blood, the lower your risk for heart attack or stroke. A normal level is 130 or less; people with heart disease or diabetes should have levels well below 100. BMI: body mass index, the most widely used measure of weight relative to height. A normal BMI for an adult is between 20 and 25. Adults with BMIs between 25 and 30 are overweight, while those with BMIs over 30 are obese. Doctors may recommend that "morbidly obese" adults (a BMI over 35 or 40) consider weight-loss surgery, as lifestyle changes alone are unlikely to bring them down to a normal weight. Metabolic syndrome: defined by the National Heart, Lung, and Blood Institute as a cluster of related risk factors that increase a person's risk for diabetes, heart disease, and stroke. These include high blood pressure, a large waistline, prediabetes, and abnormal cholesterol measurements. NSAID: non-steroidal anti-inflammatory drug. These medicines (think over-the-counter ibuprofen, such as Advil or Motrin) treat occasional aches and pains as well as chronic arthritis. Unfortunately, long-term NSAID use can cause stomach ulcers and heart and kidney problems. Idiopathic: Defined in the dictionary as "arising from an obscure or unknown cause," this is the term we doctors use when we can't explain what's causing a patient's symptom or condition, despite thorough examination and the usual tests. For help decoding medical terms you may encounter, see the online glossaries at Dummies.com and Familydoctor.org. Although these resources can be useful, if you don't understand what your doctor is telling you, please ask him or her to translate in plain English. Doctors often don't realize when they're using medical jargon or just not getting their point across. Most importantly, remember that the only "dumb" question at a doctor's visit is the one you have, but don't ask. The above post was first published on my Healthcare Headaches blog at USNews.com. Below is the text of a proposed resolution that will be submitted by the District of Columbia Academy of Family Physicians to next month's Congress of Delegates of the American Academy of Family Physicians in Orlando, Florida. RESOLVED, that the American Academy of Family Physicians consider developing an independent process for updating selected preventive care guidelines that are not being updated in a timely fashion (e.g., within a 5-year time frame) by the USPSTF.